contains a whopping 950mg of Omega-3s per capsule! Increasing consumption of fish high in omega-3 fatty acids is a well established way to improve our health. Fish oil has been associate with improvement of cardiovascular events, depression, triglycerides, hypertension, metabolic syndrome, and inflammatory conditions such as rheumatoid arthritis. The problem is that the quality and potency of fish oil supplements can vary significantly. We are one of a handful of companies whose fish oil comply with the CRN Monograph. All of their fish oils are tested for pesticides, heavy metals and other contaminants. The molecular distillation process used in the manufacturing of this fish oil also makes it pure and potent, with much less GI upset than other brands. Many are very familiar with the anti-inflammatory effects of fish oil, and how fish oil can help the cardiovascular and neurologic systems. However, many athletes do not realize that fish oil can have an anabolic effect as well, enhancing muscle growth and improving recovery after exercise. Increasing consumption of fish high in omega-3 fatty acids historically was a well established way to improve our health. Unfortunately, too many of our coastal fishing waters our polluted, and fish can contain high levels of toxins such as mercury. Fish oil supplementation has been associated with improvement in cardiovascular events, depression, triglycerides, hypertension, metabolic syndrome, and inflammatory conditions such as rheumatoid arthritis. The problem with many fish oils is that the quality and potency of fish oil supplements can vary significantly. Omega Cell fish oil, unlike many in the industry, complies with the CRN Monograph, which requires that fish oil is tested for pesticides, heavy metals and other contaminants. The molecular distillation process used in the manufacturing of this fish oil is very expensive and time intensive, resulting in fish oil that is pure and potent, with much less GI upset than other brands. Another advantage over other fish oil brands is that Omega Cell is in the triglyceride form, allowing for easy penetration and absorption through our cell membranes. 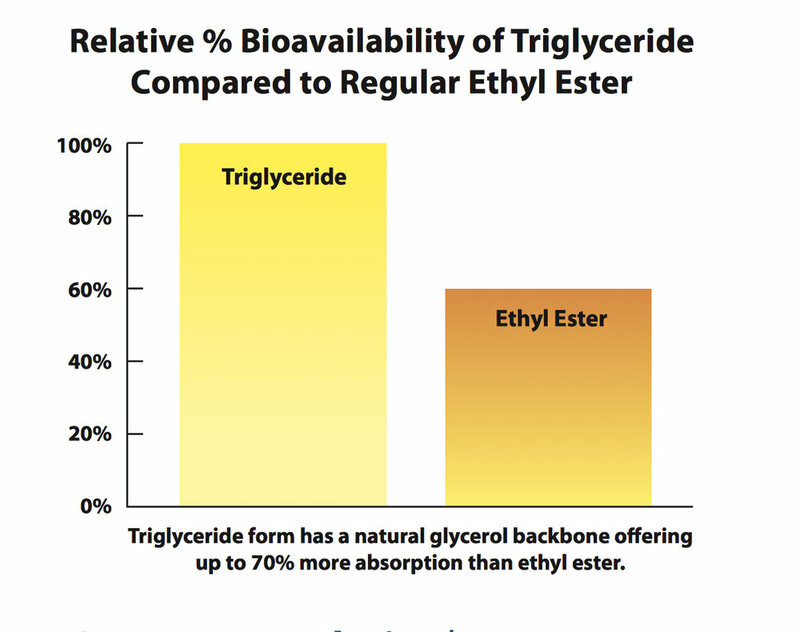 Most other brands are in the ethyl ester form, which does not allow for optimal absorption.